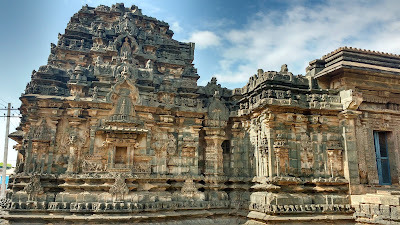 The Deccan region of India - from the Narmada to the Kaveri - was for a greater part of 6th through 12th centuries was controlled by various kings of the Chalukya dynasty. 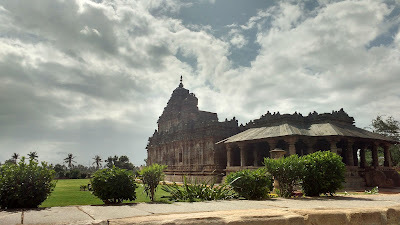 The last major faction of this dynasty to wield substantial power was the Kalyani Chalukya dynasty, based out of the city of Kalyani (Basavakalyan of today). 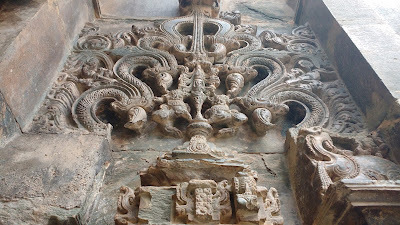 Nothing of the capital remains, but major artistic work from that period survives in the tiny forgotten village of Lakkundi. 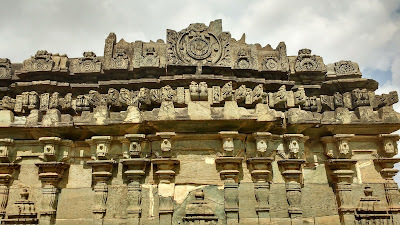 The architecture of the region is collectively surmised as the 'Gadag School of Architecture'. 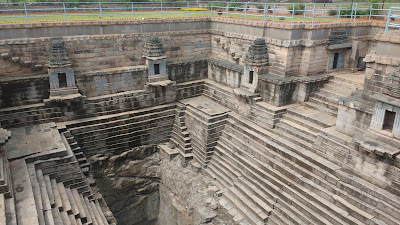 Lakkundi is a miss-pronunciation of the original name Lakshmi Gundi - residence of Goddess Lakshmi. The small village is settled in an approximate area of 1 sq. km. 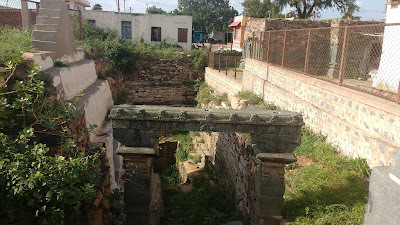 It is claimed that there are at least 50 temples and many more stepwells in this village. 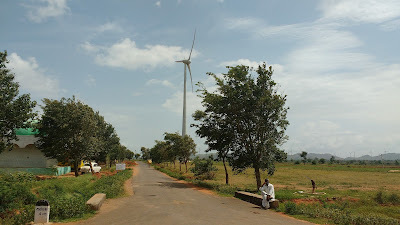 The present day village is surrounded by windmills. 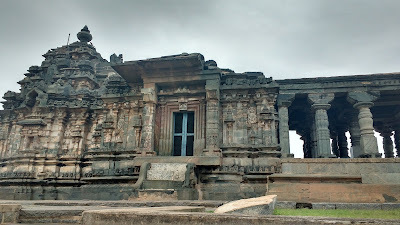 Lakkundi lies on the highway that connects the town of Gadag to Koppal and further the Hosapete. 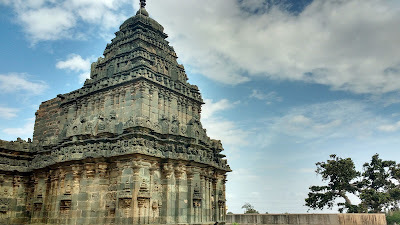 Gadag, at 6kms, is the major commercial and administration centre of the region with good road and rail connectivity from all over the state and contry respectively. A local city-bus charges Rs. 15 for a one way ride to Lakkundi with a very decent frequency. 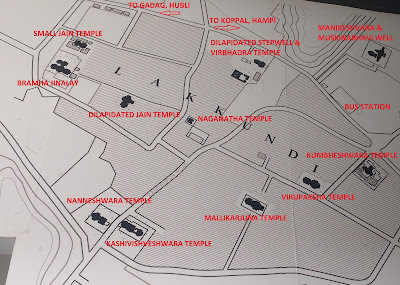 Lakkundi sites can be done on foot if you have considerable time on your hands. Rickshaws are available, but negotiate hard. Head over first to the ASI office near the Jain Complex where tickets are to be drawn - Rs. 15 per person - and guides can be booked. This is also the only available tourist washroom, so make good use. 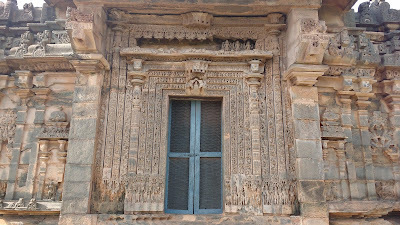 Jainism entered the Chalukyan empires from sometime before the 12th century. As patronage for the new sect increased, the related arts also gained visibility. 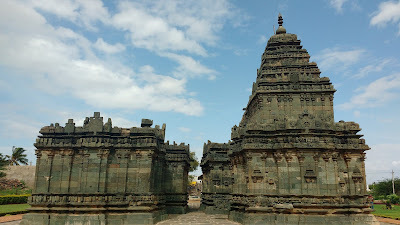 The Bramha Jinalay complex is a set of two Jain shrines - the Bramha Jinalay itself and another one cleverly referred to as small Jain temple. 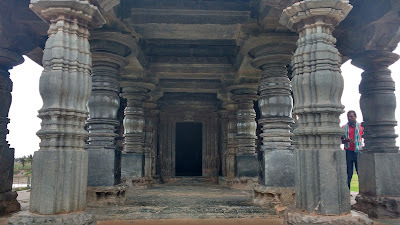 A third dilapidated Jain temple is located a little away from the complex. 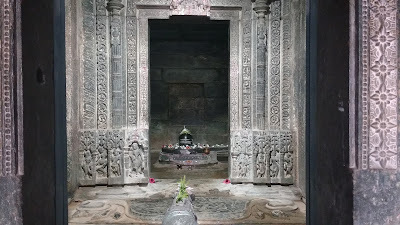 The Bramha Jinalay derives its name from two sources: Bramha from a four faced statue of Lord Bramha, and Jinalay from the fact that the main deity here is the Jain Saint Adinath. 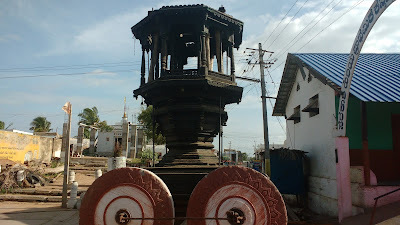 The statue of Bramha does not originally belong inside this temple, but was relocated along with a Padmini statue, both being placed on shiv-ling pedestals. 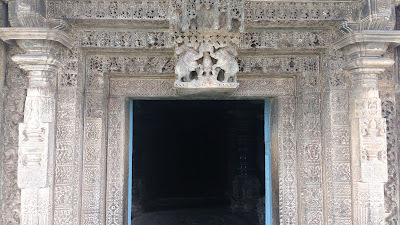 Outside the small temple sits a Tirthankara statue with its head broken off. 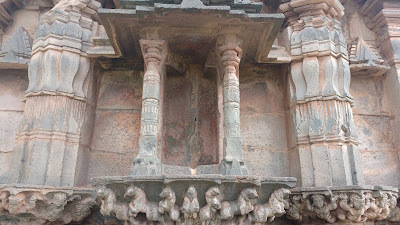 This is a moderate temple near the Kashivishveshwar complex, supposedly an earlier prototype. 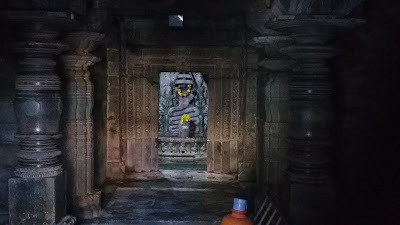 This single monument is actually two temples - one of the Kashivishweshwar (Shiv) and other of Suryanarayan directly facing it. 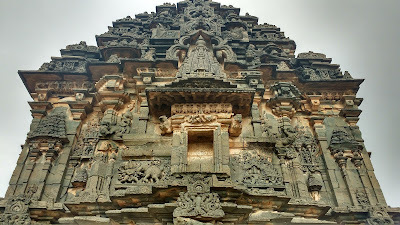 The temple is moderate in size but rich in carvings with mythological scenes seen prominently. Lets fight an elephant, shall we ?.. This temple worships the serpent. 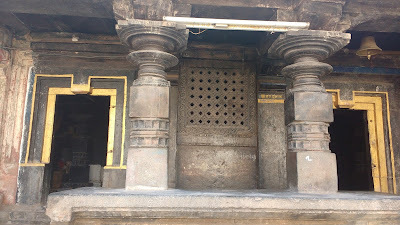 This is an active temple, located inside the main village outside of ASI bounds. The main idol of Nagnath is superb. 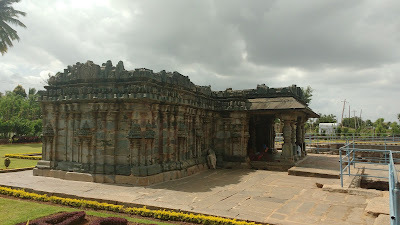 The Manikeshwara temple is small-ish and features moderate architecture. 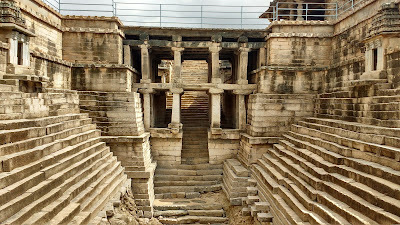 This, it makes-up with the massive Musakinabhavi Stepwell adjoining it. One can descend all the way down to the well floor - which is dry. 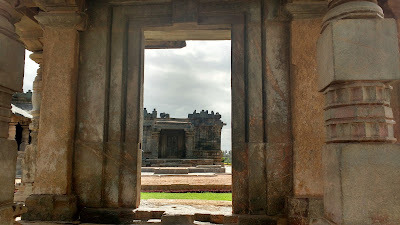 The place, although under ASI, is still under active worship so appropriate reverence should be maintained. 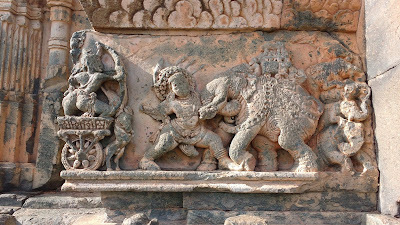 The major 6-7 monuments of Lakkundi are preserved by the ASI with typical gardens and beautification practices. ASI also maintains a museum with its office. There is some dearth of signboards and directions, especially considering the sheer number of places that can be seen, the boards are minuscule. The rest of the monuments are now thoroughly integrated in the local life. 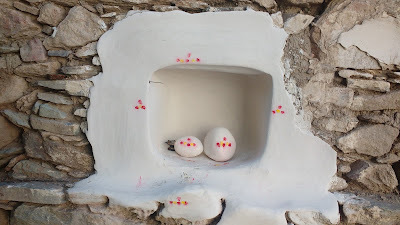 Some are places of active worship, like the Nagnatha and Virbhadreshwar Temples; some have been turned to places of leisure; some have become waste disposal pits; some are now walls of houses. Oh well. 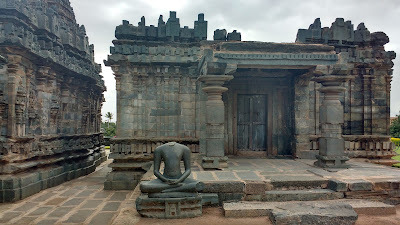 Lakkundi has very high tourism potential as a one day trip destination. 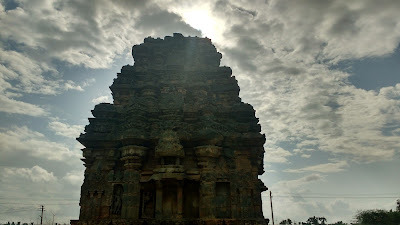 Other places like Gadag, Dambal and Itagi can be easily covered together. The facilities need to developed though. 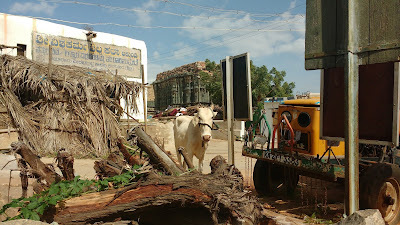 Accommodation options are available in Gadag, but frankly did not seem very alluring. A marked tourist trail can also be helpful. 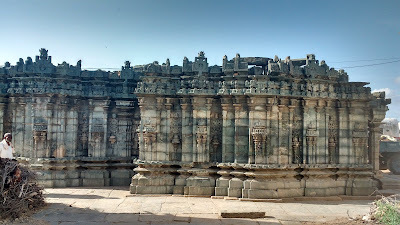 This is a great place for architecture buffs .. do visit. Have fun. Wonderful place, nice description and pictures. Beautiful. I am looking forward to visit this place.